It's finally starting to warm up! Our gang here is already gearing for warming weather with the latest round of swimming lessons. We will be ready for opening day as soon as the outdoor pools are set up! Our flip flop bands had some texture to them which helps the glue and ribbon adhere. If your flip flops are smooth plastic bands take a coarse nail file to them so they rough up a little bit. Cut your glitter ribbon to the length that fits your shoes bands. Use your lighter to heat seal the ends by running the flame carefully across the ends. Some of the glitter ribbon may catch the flame but easily blow right out. We cut two pieces and then overlapped them at the middle point where they intersect. Using your E6000 glue, dab glue dots along one side of your band a few inches at a time. Overlay your glitter ribbon on the band, and pin in place using your clips. Pay special attention to make sure you have glue at the ends of each ribbon strip. These are on shoes so you don’t want anything bouncing up and down there wiggling free as a kiddo takes off running. Leave the clips in place for at least an hour so that it can start to set up. In a few areas where I was a little heavier on the glue than others the clips would have bonded if I hadn't removed them early in the set up process. During this time we made our bows to add to the flip flops. Once they were made we use alternating dots of hot glue and E6000 to bond them to the ribbon covered flip flops. We clipped the bows in place. The glue does take 24 hrs to fully set up so we put them up where short people couldn't nab them, but tomorrow they are ready to wear! 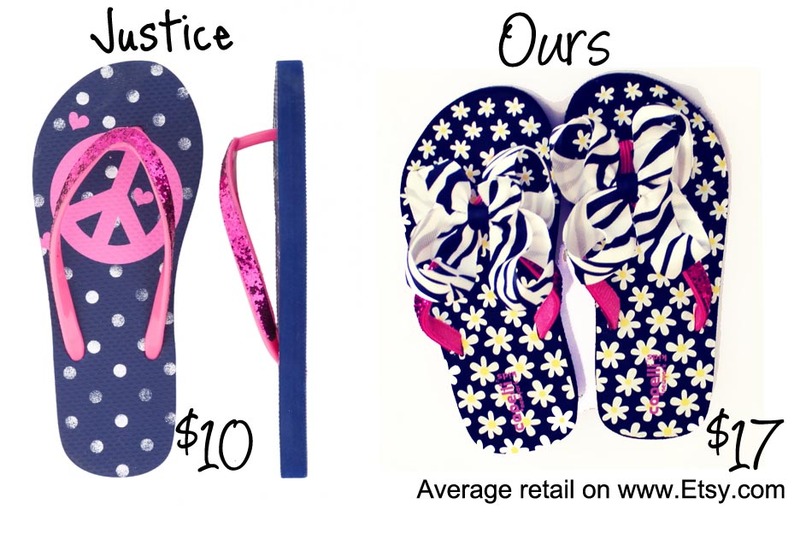 All together our flip flops were $1 for the solids, $3 for the printed pair. Ribbon and glue cost were under $3.00 per pair. If we sold these we would make a about $35 profit for 3 pairs and an hours worth of time. Since we aren't selling them to avoid screaming protests from our kiddo with a shoe addiction... we spent less than $14 for 3 pairs of awesome summer shoes instead of the mid range boutique price of 3 for $51! Pretty sweet summer gear eh? Thanks for sharing Wendy. 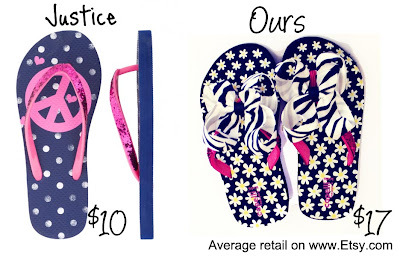 I started my flip flops last week & I'm so glad u added this tutorial for more ideas. Thanks for the tutorial - those are just awesome,Wendy. Looked at the ribbon - no black- will there be some later? I think we will pass ours down to nieces. 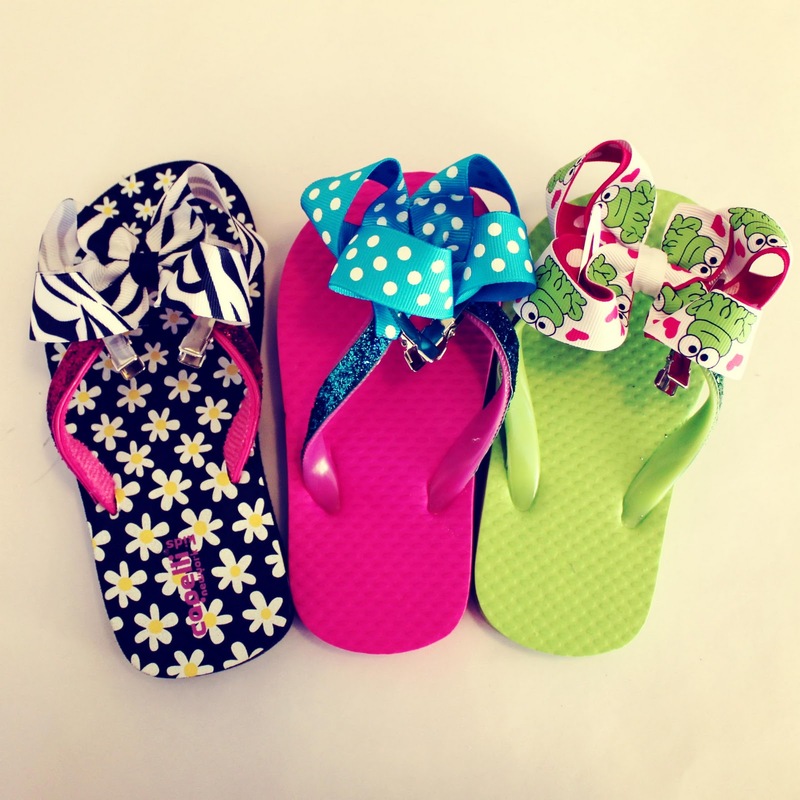 The bows on these are attached to the flip flops. If you mean bows in general when kids quit using them I would suggest if they are still in good shape to pass them off to a friend or family member. I donate older items that haven't sold that I am sick of looking at to different shelters and community assitance programs to give out as well.